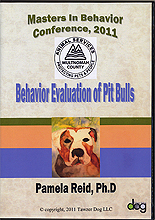 Behavior Evaluation of Pit Bulls was taped at the 3 day Masters in Behavior Conference 2011. Pamela Reid is a certified applied animal behaviorist. She received her Ph.D. in Psychology with a specialization in animal learning and behavior from the University of Toronto. Pam is the Director of the ASPCA Center for Behavioral Therapy in NYC. Through the Center, Pam consults with pet owners, veterinarians, trainers, and shelter personnel on animal behavior and behavior problems. She also supervises graduate students and conducts research in applied animal behavior at the University of Guelph. Pam lectures on animal behavior, learning theory, and agility training in the U.S. and Canada.